Curtains are great materials to achieve a great makeover for your living room for many reasons. For one thing, curtains are very affordable soft furnishings that can either be bought ready-made or be made-to-measure or make them yourself – and with a world of choices, to boot. 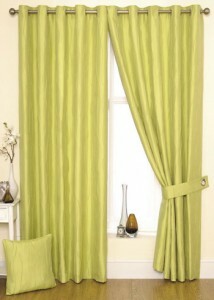 For another thing, curtains are fast, easy and convenient to install without the need for any particular skills. This can’t be said of other window treatments like mini-blinds, blinds and shutters where you need to be able to use a screwdriver! You must, however, experiment with curtains before deciding on a specific look. Experiment and take a look at ways to play with new curtains. Depending on the types of fabrics used, curtains and other similar soft furnishings can be sheer, semi-transparent and opaque as well as soft and stiff in terms of their fluidity. Obviously, sheer curtains evoke a relaxed yet romantic ambience while opaque curtains are best for privacy against nosy neighbours! Meanwhile, soft fabrics tend to flow with the breeze while stiff curtains evoke a sense of formality to the room, such as the case with drapes. With this in mind, you can start playing around with the textures of various fabrics to achieve your desired look. For example, you may want a more romantic vibe to your family living room so lace curtains are suitable, while your formal living room will look best with brocade curtains. You may even combine two fabrics like a organic cotton and sheer curtain panels. There is a wide and varied range of curtains and sheer or other curtain fabrics with interesting textures such as cambric, chintz, crewel, cotton duck, gingham, satin, silk, damask, velvet and taffeta. You may also want to play with either printed or embroidered fabrics to add interesting texture to your curtains. Nowadays, the trend is toward a minimalistic approach in curtains. You are then well-advised to avoid puddles of fabric on the floor and instead start playing with different lengths. Your best bet is to let the curtains’ edges kiss the floor, so to speak. You may also opt for other lengths such as just skimming the bottom portion of the window, midway between the window and the floor, and even valances in unexpected places. This way, your living room will be more interesting to look at even when your other furniture and furnishings are the same ones from years ago. Just make sure that there is still a sense of harmony between the curtains of different lengths in the living room. You must also play with the patterns on the curtains to set the right mood for your living room. You will be surprised at how easily you can change the illusion of space, the ambience, and the décor in the living room with skilful mixing of patterns.